How does I fix this error? Is the blocks folder in your build path? 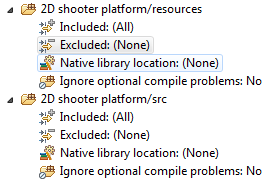 When you add the blocks folder to the build path, you have to remove "blocks/" from all the specified paths. If you have another top folder called, for example, "res" - you can insert your blocks folder inside that top res folder and add the res folder to your build path, that way, iirc, you can leave your 'blocks/' in the path name to specify their exact locations. This way you don't have to add every new folder to the build path but simply add everything inside your resource ( res ) folder like sound, graphics, music etc. Thanks for your reaction. Now I've added the blocks folder into the resources folder and add the resources folder to the buildpath. But he doesn't work, I'll get the same error. I think the resource folder isn't excluded by default? Hmm try refreshing your project? right click -> refresh. Or try what ra4king said and remove the 'blocks/' part and see if that works. Put that in you`re texture loader! Hope it helps! Do the same to every texture! EDIT: right, forgot the leading slash. Using Class.getResourceAsStream will resolve relative to the class's location unless you use a leading slash. If you're using Slick, you should be using ResourceLoader, which searches the classpath by default. I suspect it's a build problem. Try doing a clean and full rebuild. DOH, I didn't even see that. getClass().getClassLoader().getResourceAsStream() should also work.